It’s not nice to fool Mother Nature…. ….but I sure think Mother Nature is fooling around with us. This morning I looked outside and couldn’t believe what I was seeing. Through the fog I saw something bright and pink. I’ve got some roses blooming! So now we have another color added to the beautiful fall scene in my backyard. 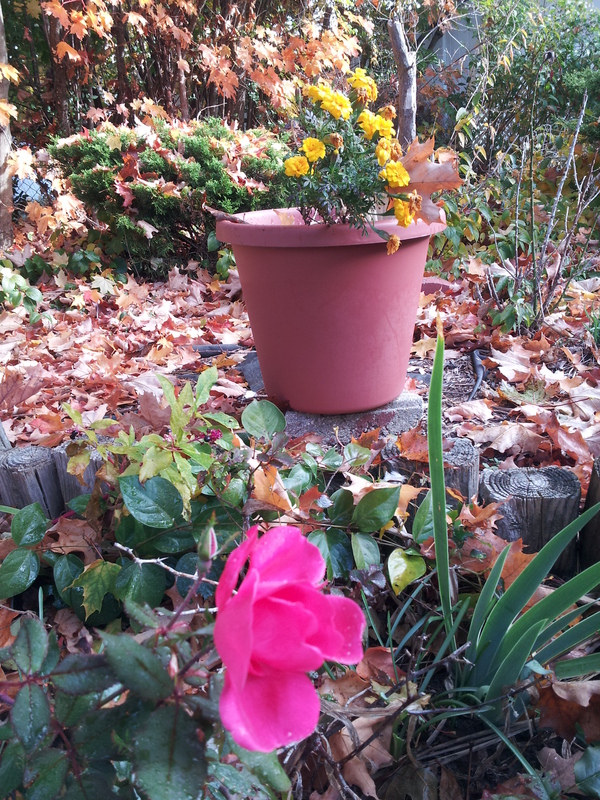 I think it looks nice and bright against the brown and gold leaves on the ground and the marigolds in the flower pot. If you are having some Indian Summer weather where you are, enjoy. I, myself am ready for cooler temps. And my roses need to head into their winter nap. This entry was posted in Fall, Gardening. Bookmark the permalink.